The work of groundbreaking Japanese artist and writer Yayoi Kusama is often typified by repeated patterns of dots or figures, and bold psychedelic colours embodying strong forms inspired by nature. 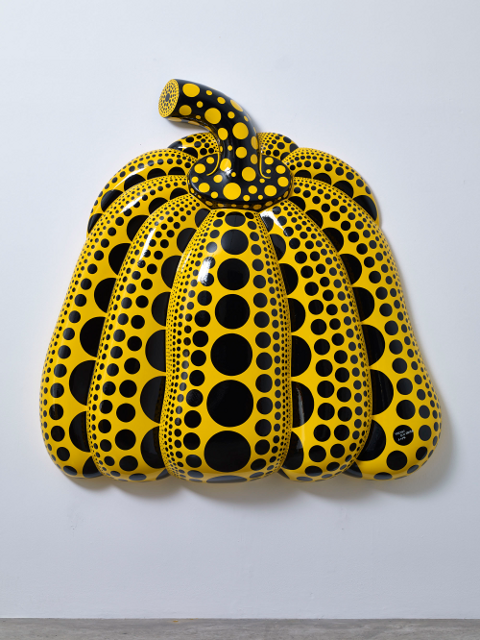 This unique style and vision is continued with her latest show — Pumpkins — at Victoria Miro Gallery. 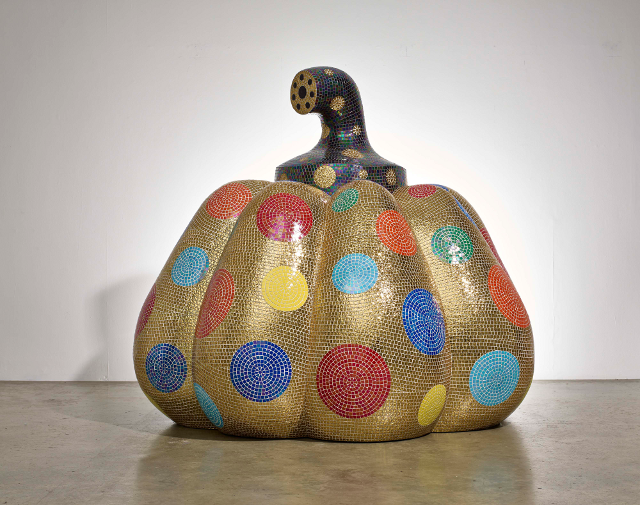 Pumpkins consists of large-scale bronze and mosaic sculptures, and celebrates the eponymous squash — a powerful symbol for Kusama. The pumpkin, she says, is reminiscent of her childhood — memories of growing up in a family whose work involved cultivating plant seeds. The pumpkin is also potent symbol of peace and the sacredness of the bond between nature and humanity. 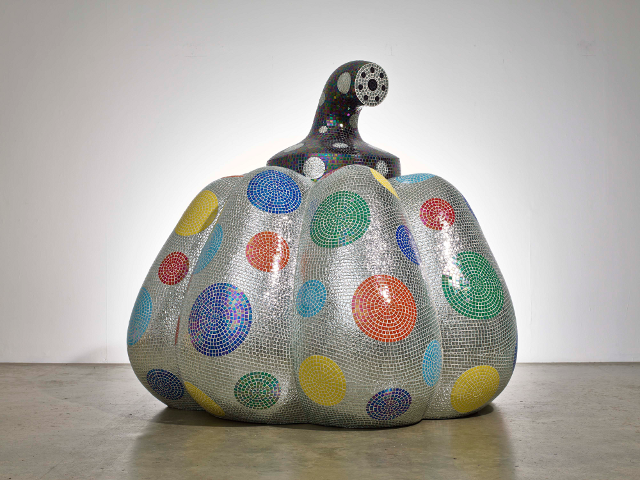 In her sculptural works and paintings, Kusama takes the natural form and magnifies it, capturing the folds and creases, and emulating the textures of its skin in the dots and brightly-coloured gilded tiles covering her works. The sculptures are playful but they also exude a sense of serenity. This is especially so with the large bronze works, displayed by a pond in the gallery's outdoor space which is filled with an earlier Kusama installation of giant floating silver balls. Kusama's paintings, exhibited upstairs in the gallery, are spirited and vibrant. Rows of varying-sized dots undulate like ocean waves. Other forms in these paintings are reminiscent of seaweed tossed by the tides. 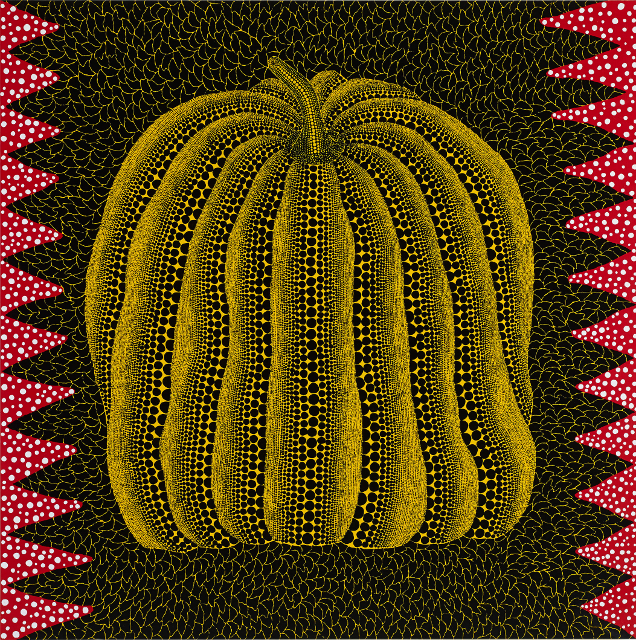 Again, in the majority of paintings, the pumpkin takes centre stage, yet the repetition of this form does not become tedious, but rather hypnotic or meditative, as variations in shape and form are explored, highlighting the individuality of simple natural forms. This exhibition is recommended for those inspired by natural forms and any fans of the 'Polka-Dot Queen of the Avant-Garde'. 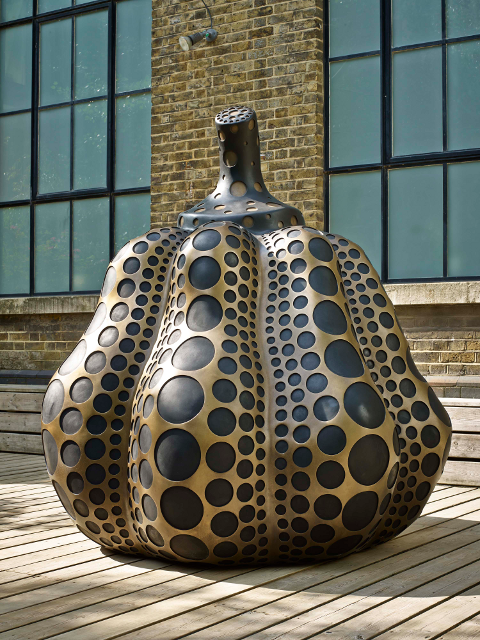 Kusama's Pumpkins runs until 4 October (interior works) and 19 December (outdoor), Tuesday-Saturday 10am-6pm. Mondays by appointment only. Victoria Miro Gallery, 16 Wharf Road, N1 7RW. Admission is free.